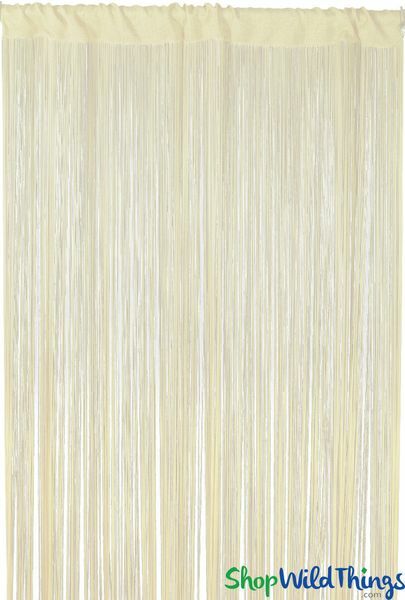 Home > Beaded Curtains & Columns > String Fringe Curtains > String Curtain Ivory 3FT x 6FT - Polyester & Cotton "Nassau"
String Curtain Ivory 3FT x 6FT - Polyester & Cotton "Nassau"
Very stylish and elegant, our 3' wide by 6' long Nassau String Curtain is a gorgeous shade of Ivory! This curtain provides very good coverage with over 400 silky soft strands that are each 72" long and the shimmer on this curtain makes it look very rich and classy! The cotton rod pocket is 3" deep giving plenty of room to slip this beauty onto just about any type of hardware, pipe, rod, wire or hanger. Another feature is that you can cut these curtains without having to worry about fraying! Ideal for windows, this is an excellent choice to accentuate other room features and the light champagne shade on this curtain feels luxurious and ritzy, very easy to blend with many color schemes. String or fringe curtains are a terrific way to accent room features - dress up a window or doorway, use as stage or photo backdrops or for store window displays and they're marvelous as room dividers or at hiding or altering the appearance of a wall, column, closet and pantry or treasure room! Having a large venue wedding or event? We can fabricate Hanging Columns to fill overhead space while creating truly unique accent pieces! There are approximately 12-13 strings per inch and this curtain is very easy to hang and walk through. 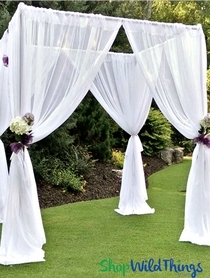 Use any type of Pipe and Drape Kit, rods or drapery hanging system including wire. This curtain weighs 12 oz. 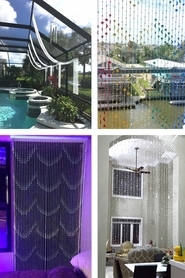 which makes string curtains an excellent alternative to traditional cloth drapes. Hang multiple panels side by side for a seamless look.